Arguably the most important feature in the Pro version of SketchUp has been the included documentation software, LayOut. While SketchUp itself is great for modeling and “inline” documentation (dimensions and floating leader text), once you need to properly document your work on a sheet of paper with a textblock around it, you are hitting a wall. That’s where LayOut comes in. After bringing us the consistently helpful masterSketchUp.com blog, Matt Donley just published his first book on SketchUp, “SketchUp to LayOut”. 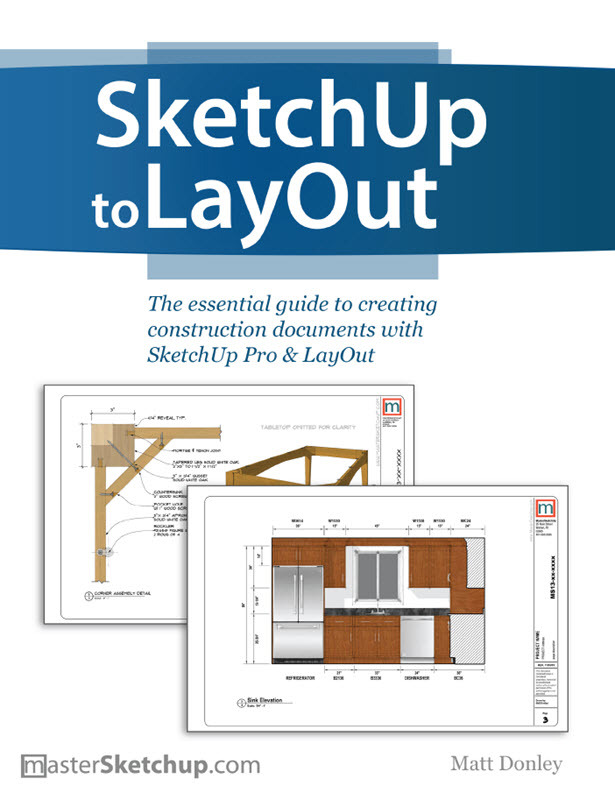 In line with the thorough tutorials on his blog, this book takes the reader from preparing a SketchUp file for export to LayOut through setting up views in LayOut and creating annotations of any kind. He then illustrates these techniques with three detailed projects that encompass furniture making, interior design as well as architectural house design.